A gentleman in his 60s comes in feeling a bit rubbish. 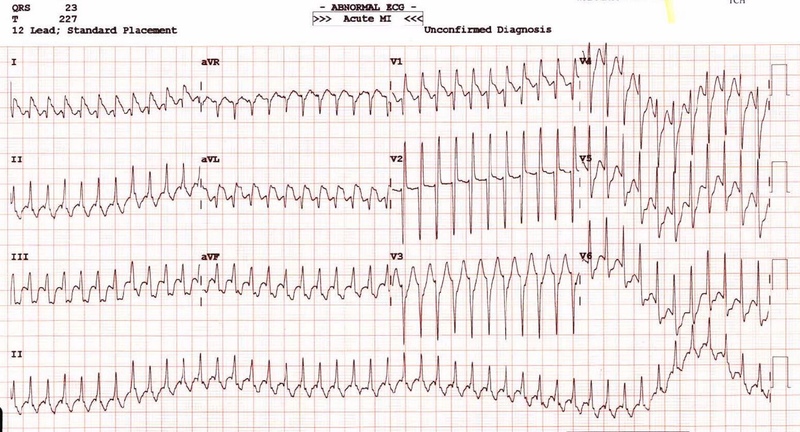 There’s no chest pain but he’s a bit presyncopal and feels washed out. How would you treat it? 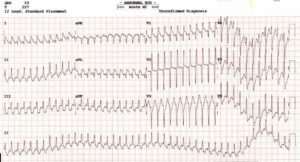 The tall anterior R waves suggest RVH, (patient had COPD, suggests corpulmonale) and thus the ST changes are likely repolarization abnormality worsening under extreme tachycardia stress! You would suspect his Right Atrium is big too, providing a structural reason for the AF – its always big with RV overload. Those with accessory pathways (no obvious sign of this, but not in sinus yet) and those with COPD on bronchodilators with sympathomimetic action! So there it is, once again the ECG diagnoses EVERYTHING!! !